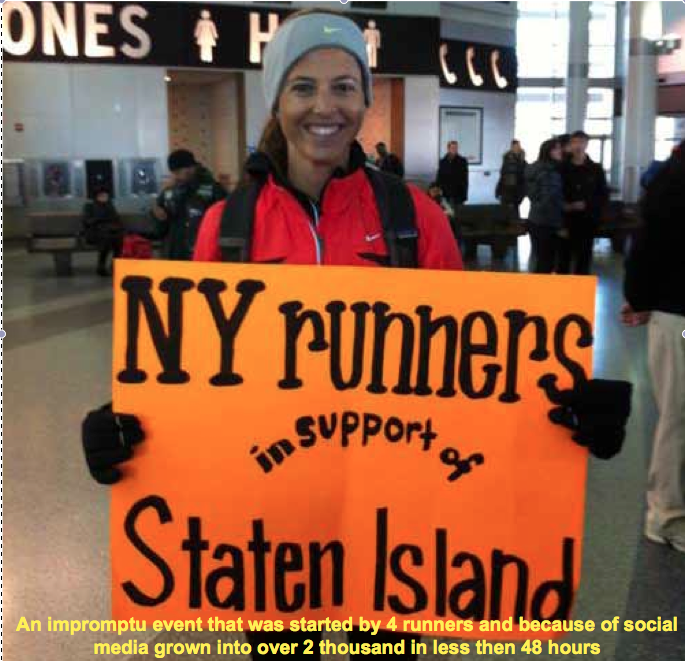 Arriving on Friday morning at La Guardia Airport and ready to run the New York City Marathon, it was slated to be my 16th. Drop the bags at the hotel and started off to the expo to pick up my race materials. It wasn’t until after that I received a text from a friend that informed me that the marathon had been canceled. It was the right decision at the wrong time! Spending all that time and money and not to run was a major disappointment, to say the least. However meeting people from the UK, France, Italy and was told how they where out thousands of dollars due to the cancellation. And not to forget the people who lost love ones and suffered so much personal tragedy, I really couldn’t hold on to my self-pity for much longer. The next morning I joined a group of volunteers to help clean up a local park. That was OK, it really wasn’t what I had in mine. We discover Staten Island was a very hilly place to run. About 3 miles in we started to see the first signs of stress, a line of cars that wrapped around a few blocks and 30 or more people standing with gas cans in hand waiting their turn for gas at the pump. Yet I didn’t think we where still in the mist of the trouble. Then a fellow runner who told me about a social media event that was really spreading quickly. It was a Staten Island run to relieve effort. Perfect! I wanted to get a run in anyway and helping people on Staten Island that really needed the most. From what I was told the people of Staten Island are the forgotten people of New York City. They are given the lowest priority on the city budget and the last to get much help. This whole idea stared with a group of four runners that formed a Facebook page and by that night they had 400 likes. Within 24 hours it increased to 4 thousand! They instructed us to wear our official orange marathon shirts, fill back packs with food, clothes and meet at the lobby entrance to the ferry. Next they subdivided us into groups, not by pace but miles. We could do as little as 3 and as much as 14. We reached the first drop zone at mile 7. They had lot of supplies there but we were told more was needed up the road about another 2 miles. We were warned that it was very bad and the damage was much worse. A few runners didn’t want to go further. I said what’s another 2 miles? We where going to do 26 anyway! They asked if we could take some more supplies with us. Our pack grown by another 10lbs. I was proud of my fellow runners! Within the first half mile out of the drop zone we couldn’t run on the sidewalk much longer. We gotten into an area that was torn apart from high winds and water, debris was everywhere, down power lines where common. There where many small drop zones along the way and we did notice the Salvation Army which and we dropped a few supplies off there. Our final drop zone was very large and was run by the Red Cross and National Guard. We drop the rest of our supplies with them. They ask if we could distribute food and water into the neighborhood and of course we gladly agreed to help in any way we could. At this point we had separated into much smaller groups so the four of us set forth into the streets. We kept on asking people if they needed any food or water, the first round of supplies went fast. Brian was a local and he told his story of his father and mother both in there 70’s. How they escaped from the flood waters that engulfed their home. How the water raised so quickly that the only means of escape was to punch a hole in their roof by means of a two by four. He then asked where I was from I told him Chicago, he began to cry. I hugged him and patted him on the back and told him “We are here for you guys.” Also his broth- er Jim and I chatted a bit about Staten Island and New York and after 20 minutes letting them vent they said “God bless you guys!”. We got many of those type of responses all day long. We gathered forces with Jim and Joe a local runner from NY. They ask if we could lend a hand with some water damage removal. There we assisted Mary Anna who was 70 years old trying to clean up her shed. The National Guard was there earlier and wanted her to go the hospital due to her high blood pressure, she refused. Thus Jim and Joe were helping her getting trash out of a very damaged shed and to the curb. Five guys are better then two (keep in mind where all in our running outfits and didn’t think we where going to help in this fashion). Alisa duty was to keep Mary Anna calm and out of the way of all the mud and the wet soaked items. We took all the items to the curb along with the busted down shed and part of a 12×8 foot wall that floated into her back yard. You could tell by the inside of her home the water reached to the top of her kitchen cabinets. She told us how she got out of her house. 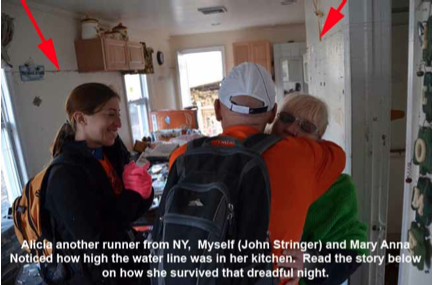 The water was so high she said that she couldn’t get out of the door and then she noticed a rescue boat. She used a flashlight to signal from her kitchen window only to find that the boat was filled. She then took a plastic tray and floated out of the window she hung on to the outside gutter. She the noticed a blazing fire that was only a block away. She was then rescued a short time later. We all received a very big hug from her. We did find that house that she talked about. It looked like the fire was started from a downed power line. It was completely gutted and I can only hope they survived. So now the six of us started heading out before it got too dark. Running back we received a lot of honking horns, waves, and thumbs up from passing cars. One guy walking shouted out “You guys are our my heroes” although I really liked his sentiment, it wasn’t deserved. Still from a New Yorker that said a lot ! This run wasn’t my PR (personal record) but it was my personal best!